3. Physical Dimensions : 30-36 cm (dia) X 5-7 cm (H) Can be custom made to any size. 6. Application – How it works : Insects naturally attracted to pheromone,fall into the pool of emulsion/water in the tub,drown and die.The dead insects can then be removed from the trap at appropriate intervals and the tub refilled with emulsion/water. Fruits, Vegetables, Cereals or Food grains whichever be the crop it is prone to damage by pests of various kinds that devour the crops resulting in crop loss ranging between 10% to almost as high as 90%. By using pesticides to control/kill these pest populations, the farmer ends up spending lot of money, many times ending up with losses. This happens because, the pests develop resistance due to indiscriminate usage and so the particular pesticide doesn’t work resulting in the need to apply larger quantities or costlier next generation pesticides. Many times pesticides are adulterated or spurious and so don’t work. Some times, if it rains after the pesticide is applied, it gets washed away and the effect on the pest may not last or be good enough. Thus the farmer ends up spending more money. Usage of pesticides not only results in a lower price realization for the produce, but many times consumers refuse to buy, especially if it is to be exported, because of high residual levels of pesticides. Added to this, pesticides damage the environment, contaminate underground water sources, are harmful to people causing deadly diseases like cancer and result in fast depleting crop output in a matter of 2 to 3 years! The solution lies in “Integrated Pest Management” using Pheromone Lures/Dispensers and Insect Traps. These Lures and Traps help in drastically reducing usage of pesticides by monitoring the growth in pest populations, helping the farmer to decide the exact timing and volume of pesticide application thus completely eliminating indiscriminate pesticide spraying. 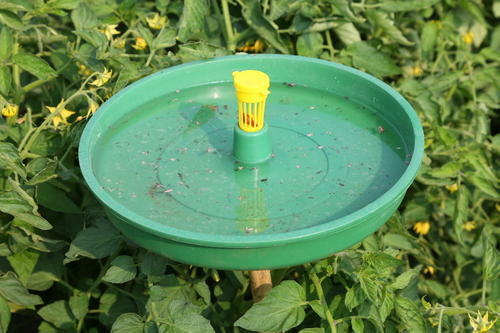 For some crops, Lures and Traps can even be used as complete substitutes for pesticides, thus totally eliminating pesticide usage resulting in better quality, better yields, better prices, better markets, better profits, better environment and better health all around.